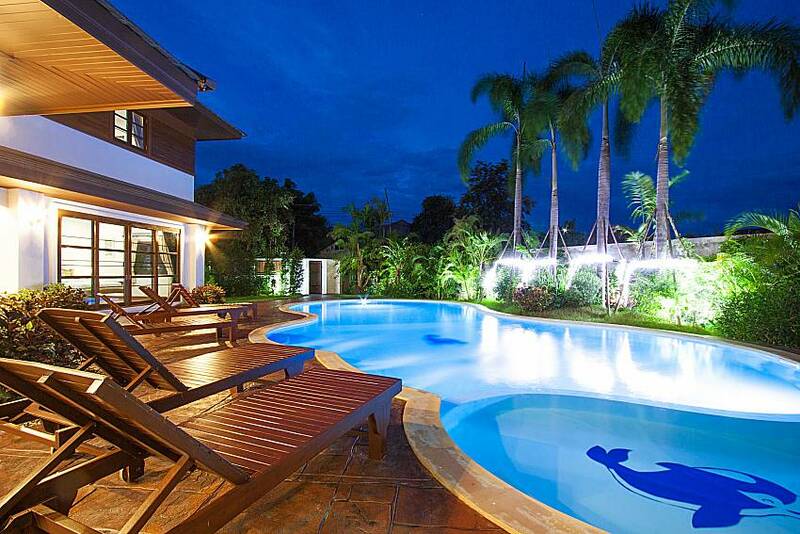 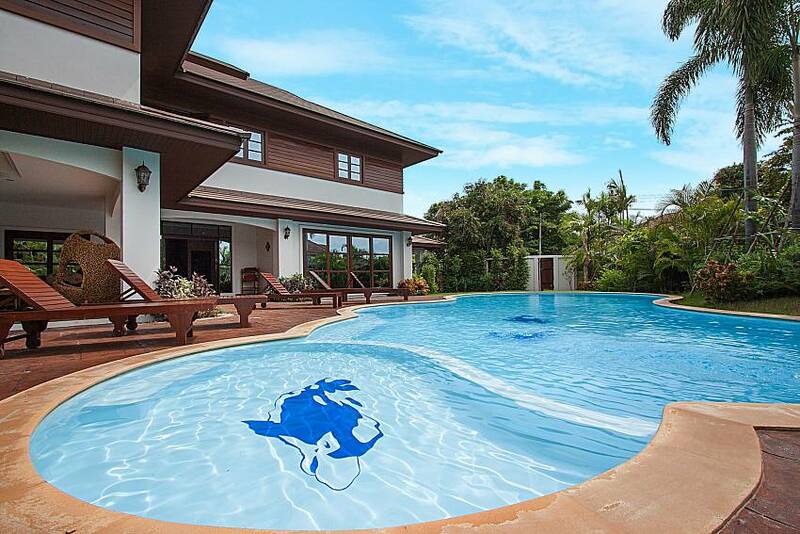 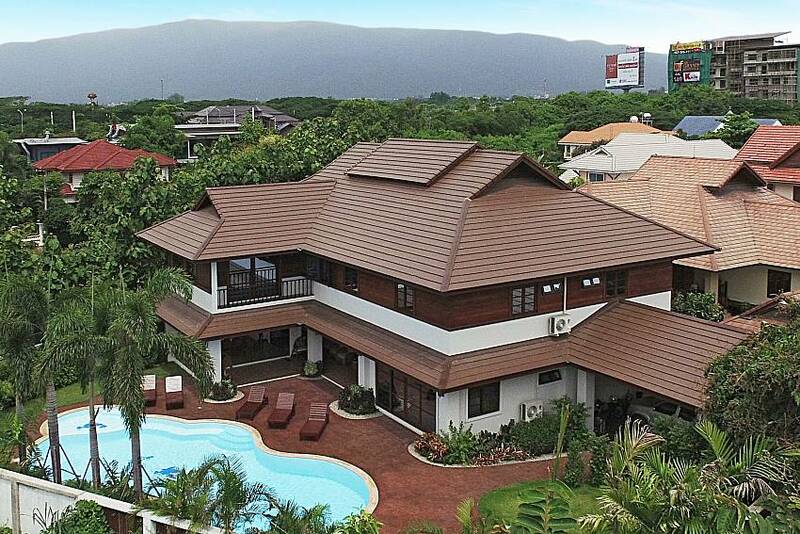 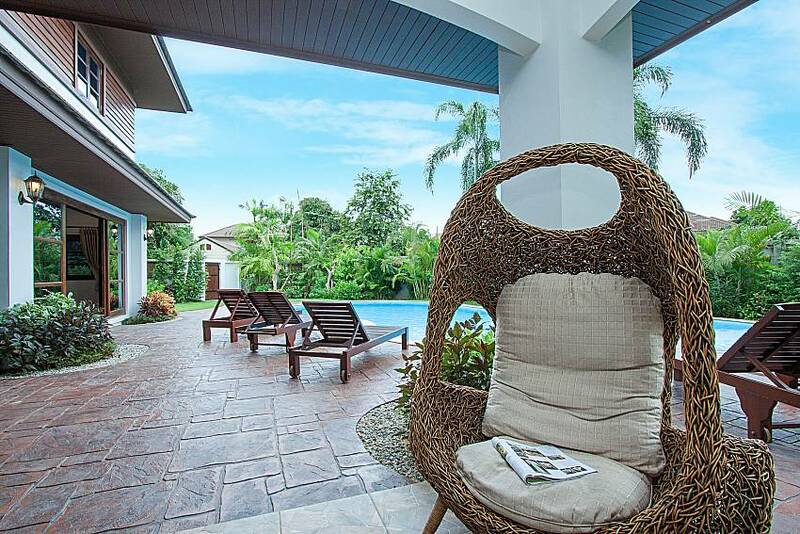 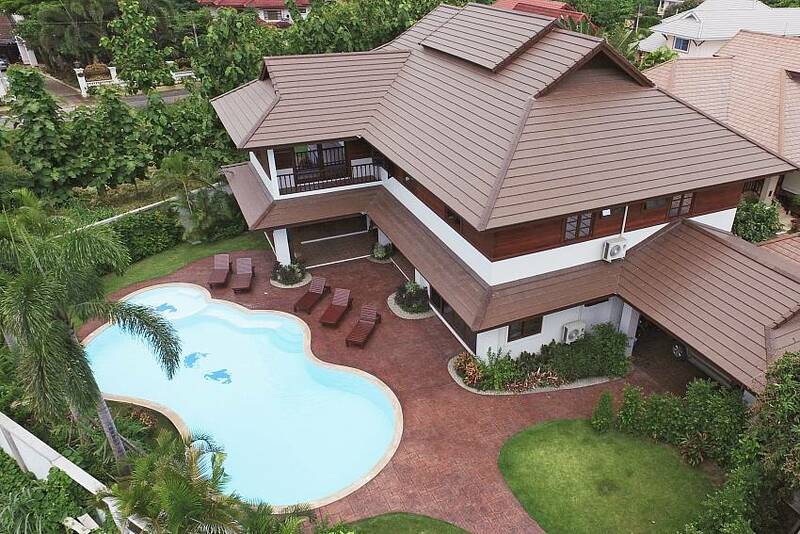 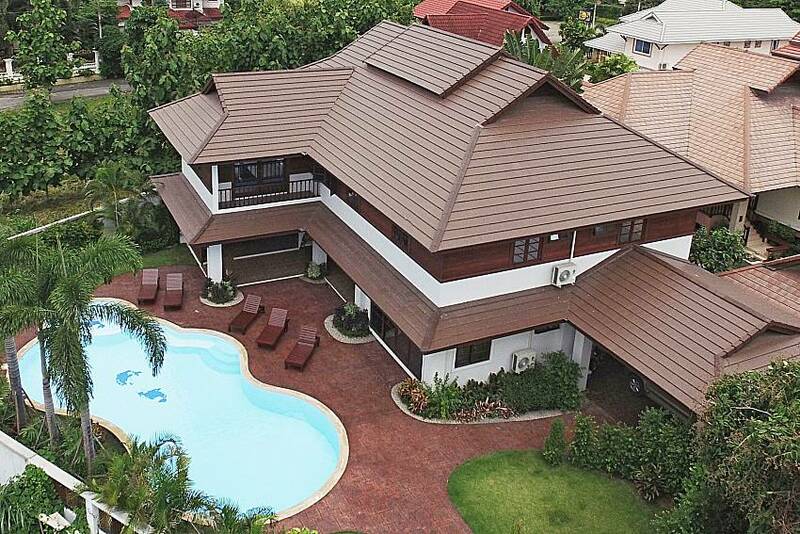 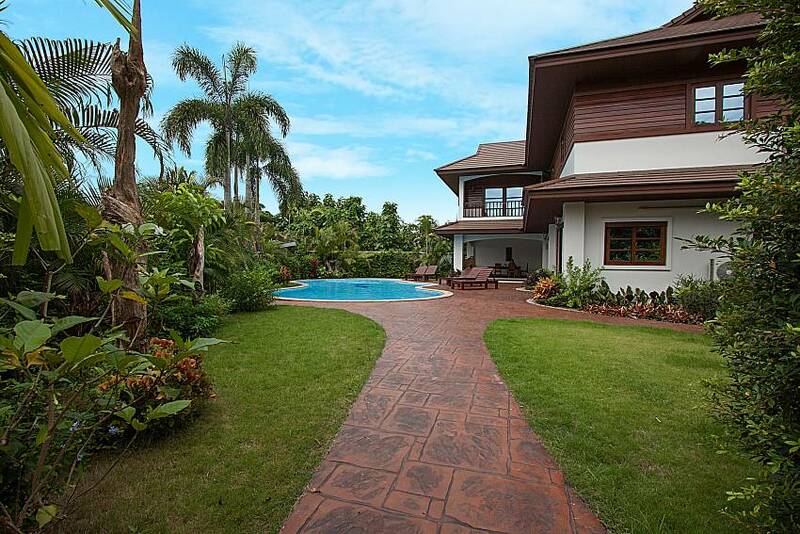 This large 2-storey villa features all amenities a large party would need on their dream holiday. 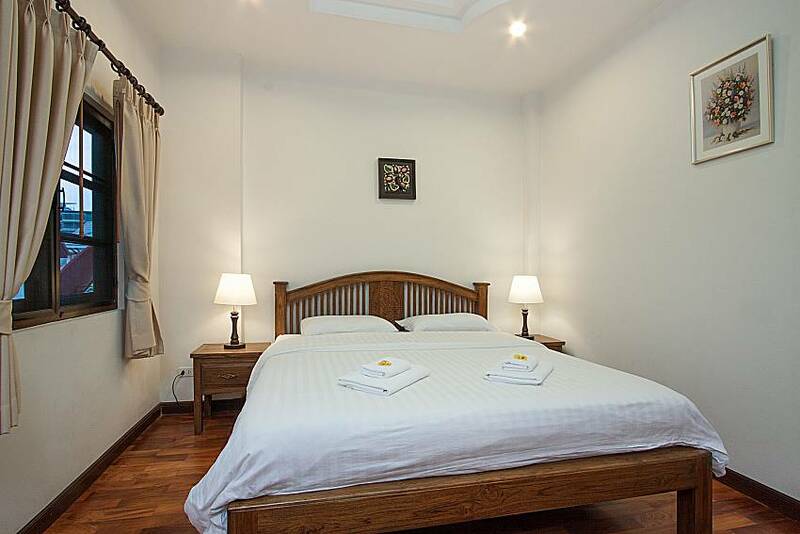 It boasts a mix of Western comforts and Northern Thai décor known as “Lanna”, which is sure to captivate its guests. 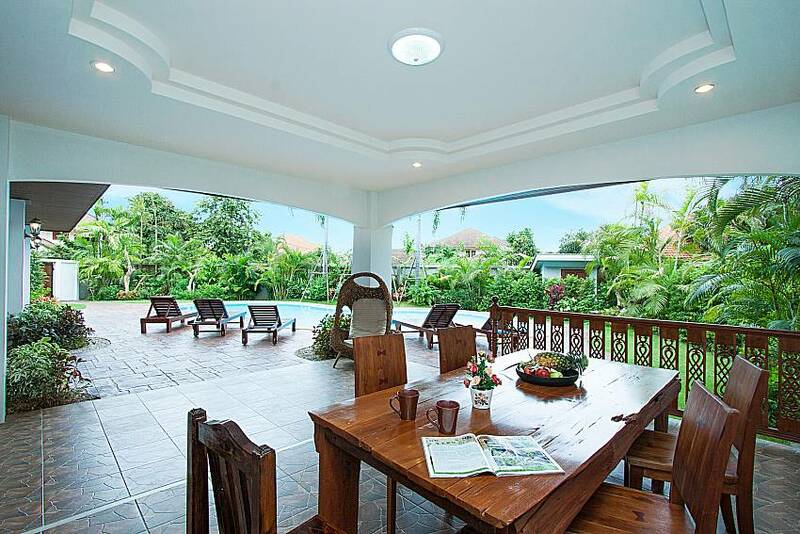 While visually interesting, every area in the villa is made with contentment in mind and all furniture pieces are from real wood. 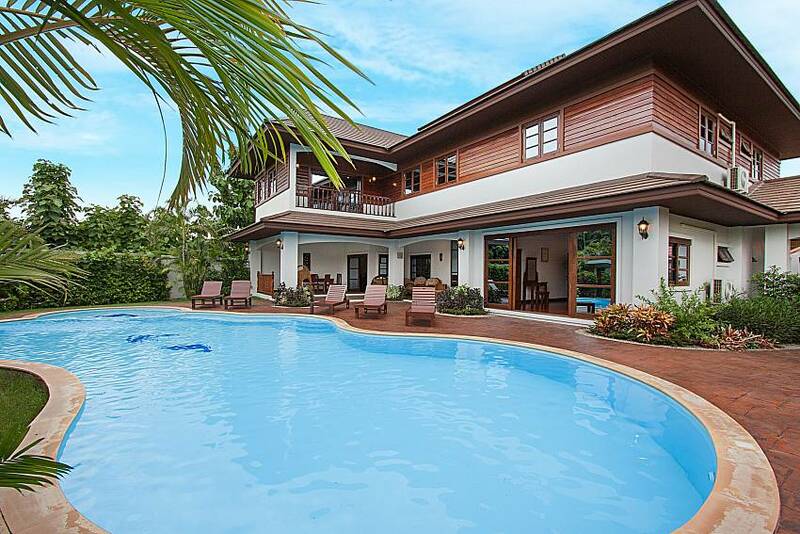 The villa has a lively tropical garden with a large free-form swimming pool surrounded by sun loungers, seated areas and BBQ – for when you feel like having one of those laid-back days in a green tropical setting. 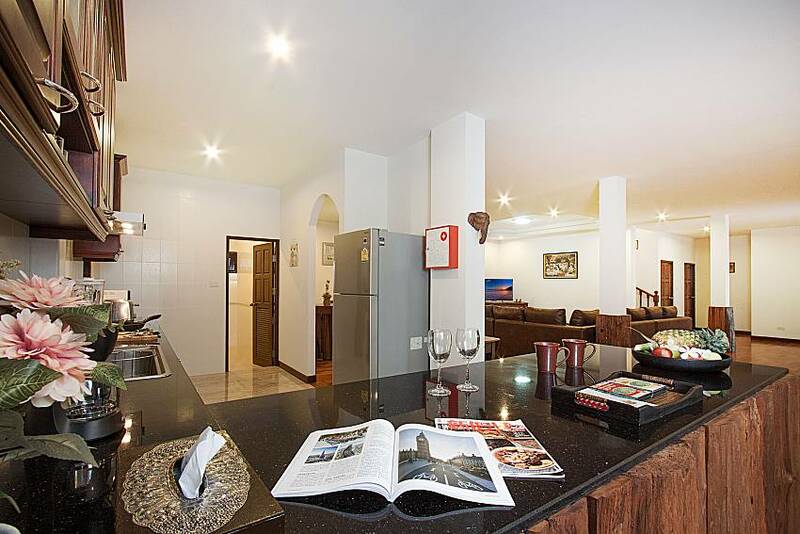 Inside the villa, you will first find yourself in a very big open plan living room with a sofa, flat-screen TV with 100+ international channels, and a bar where you can mix your own concoctions. 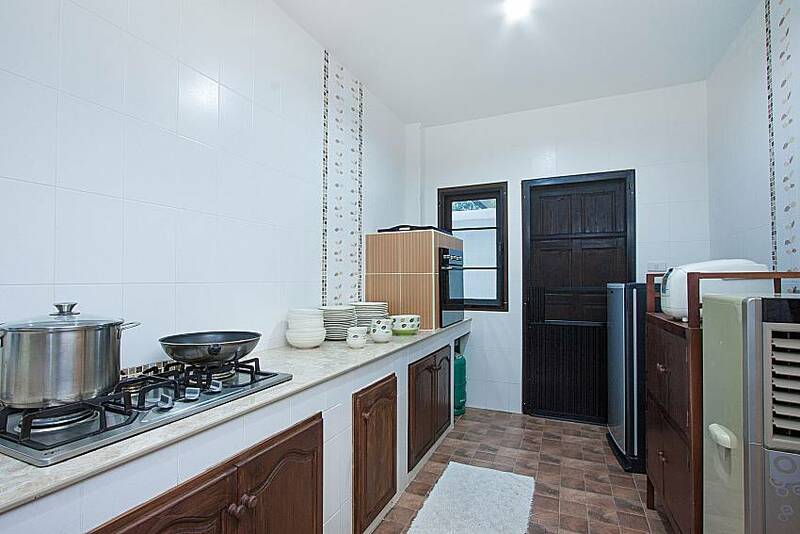 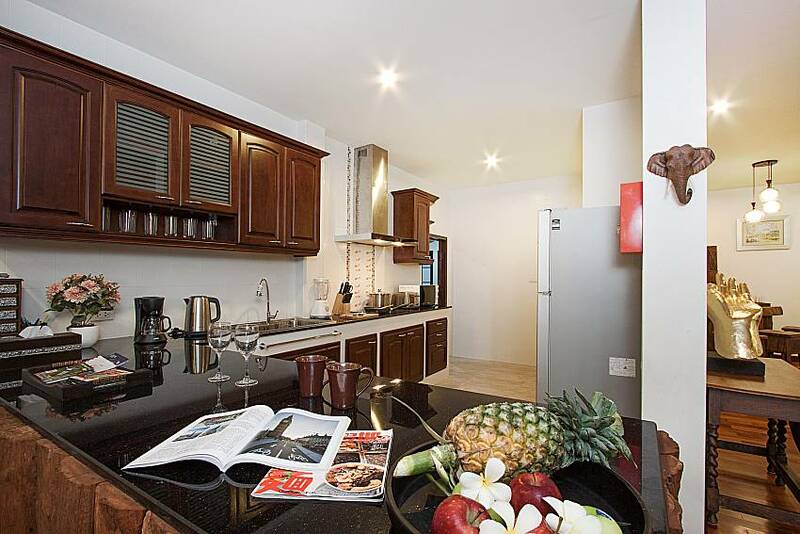 Next to it there is a modern European kitchen with electric appliances such as a coffee machine, kettle, microwave, toaster, refrigerator, and electric stove; the villa has another Thai-style kitchen in the back with a pantry, stove and oven. 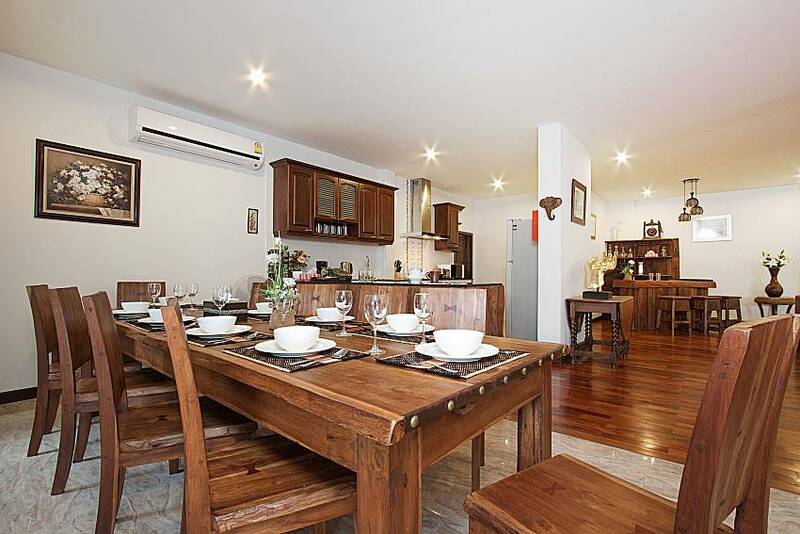 Adjacent to the European kitchen in the main living area there is a wooden dining table with 10 chairs. 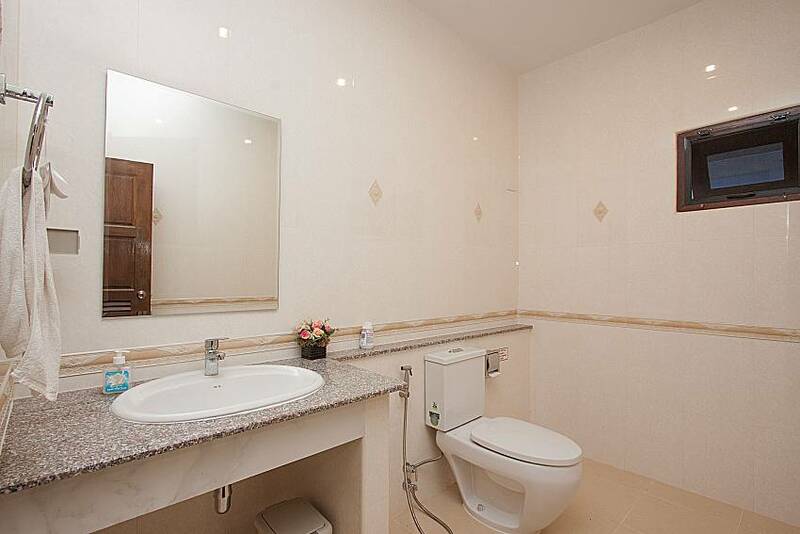 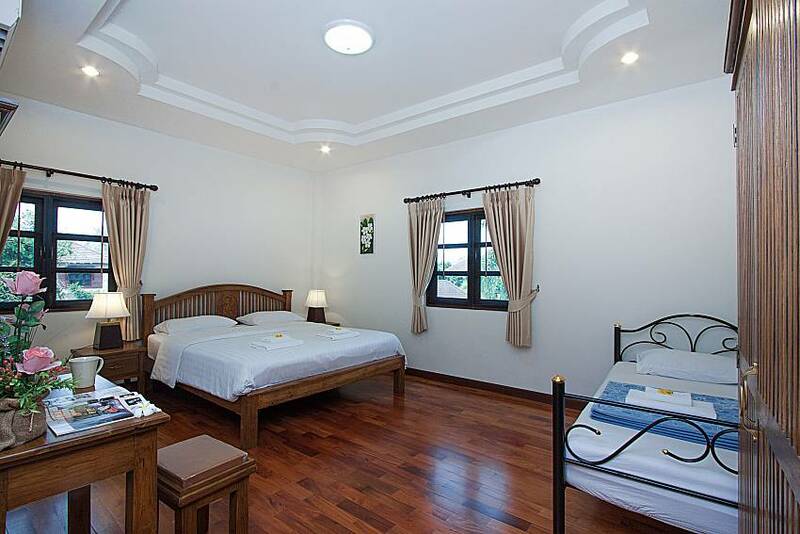 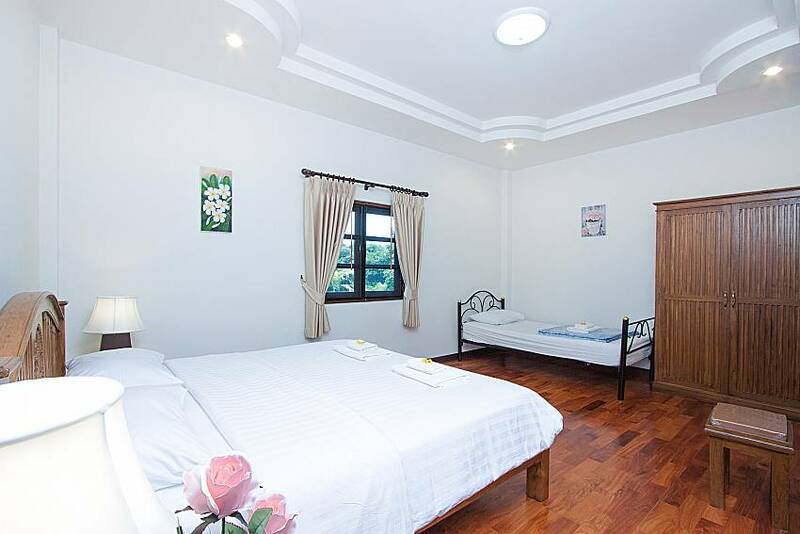 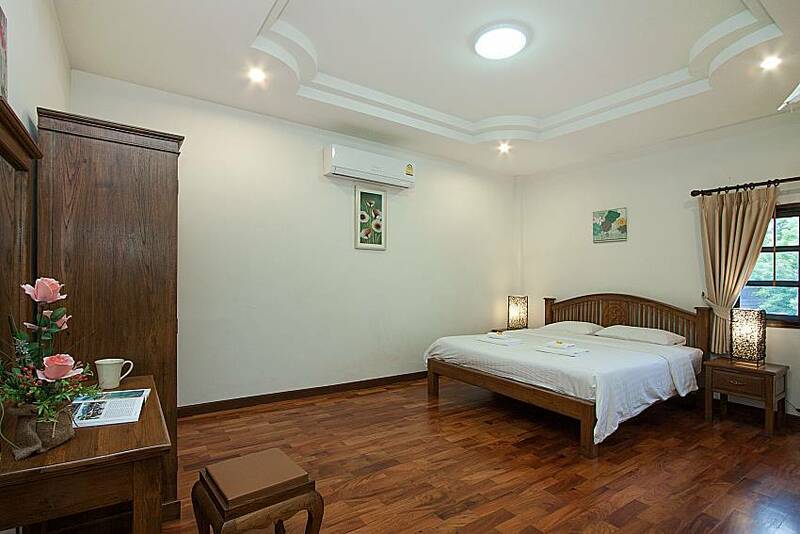 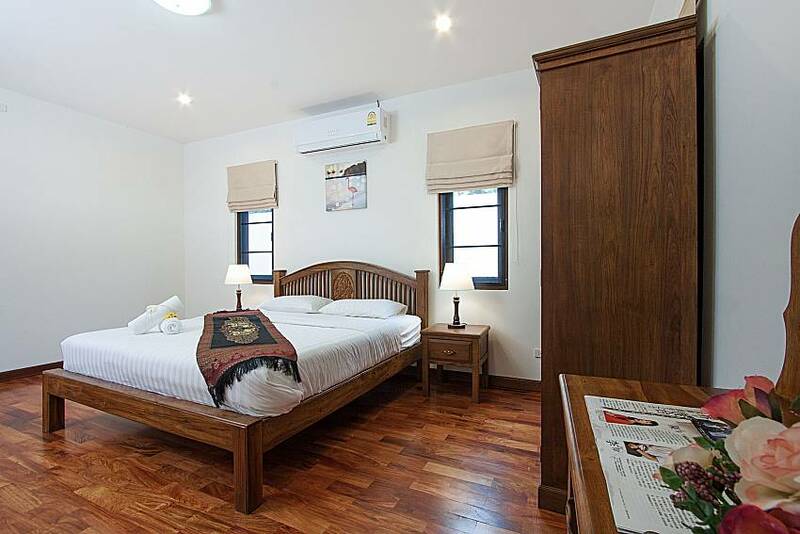 Two of the 7 bedrooms with private bathrooms are also on the ground level, suitable for children or elderly as they wouldn’t have to climb the stairs, and they open up to the pool garden. 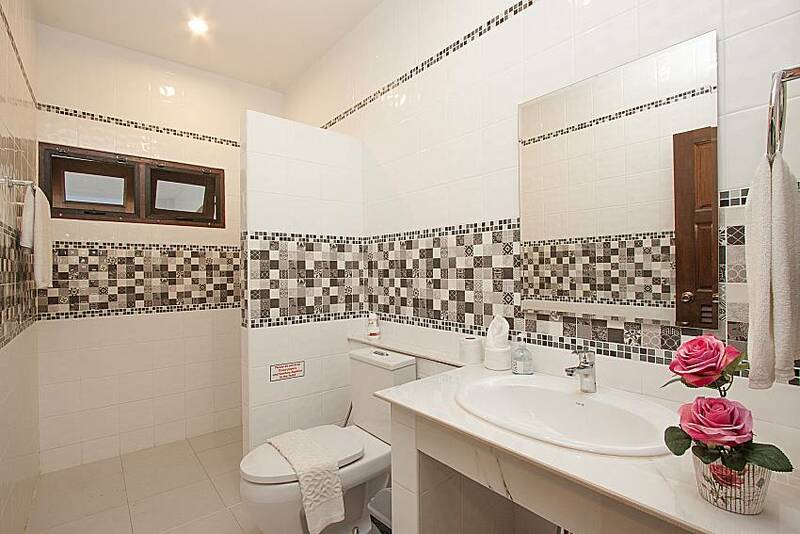 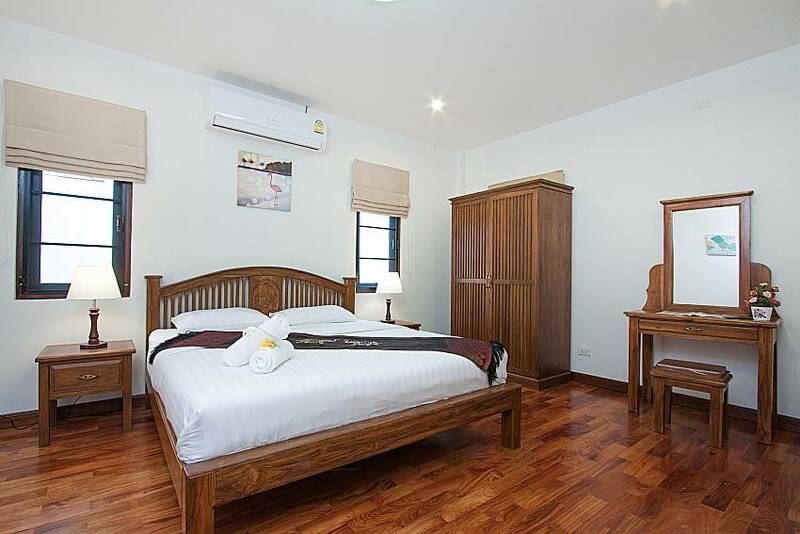 All 7 bedrooms have wooden floors, wardrobes, dressing tables, air-conditioning and en suite bathrooms. 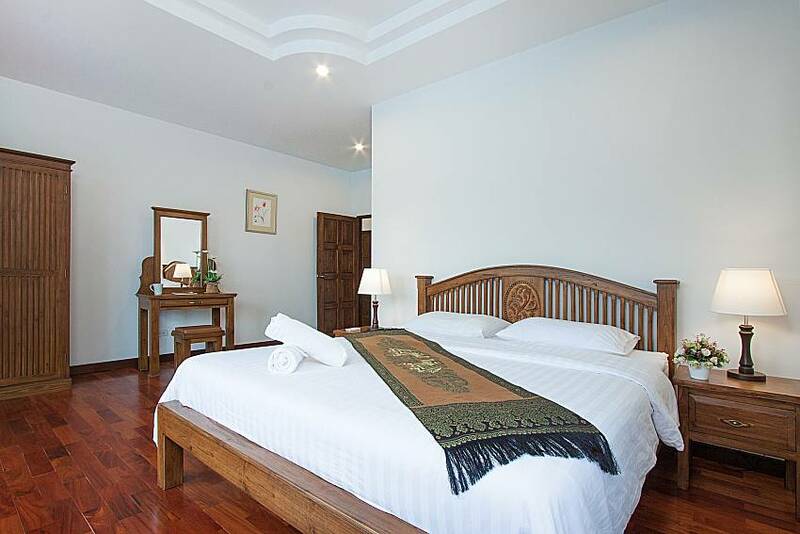 Five bedrooms are located on the villa’s 1st floor, including the master bedroom which has a balcony and a bathtub in its bathroom. 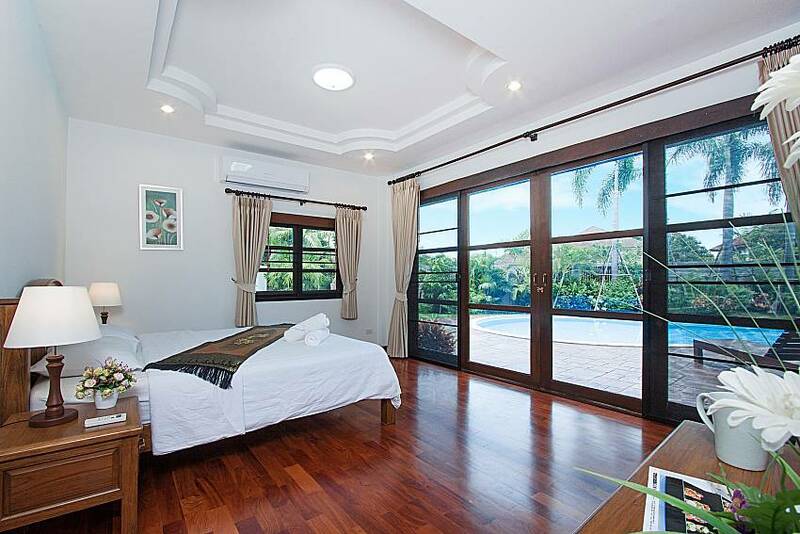 The villa can sleep 14 people in its standard configuration; up to 8 beds can be added throughout all bedrooms for an extra fee, sleeping a maximum of 20 persons. 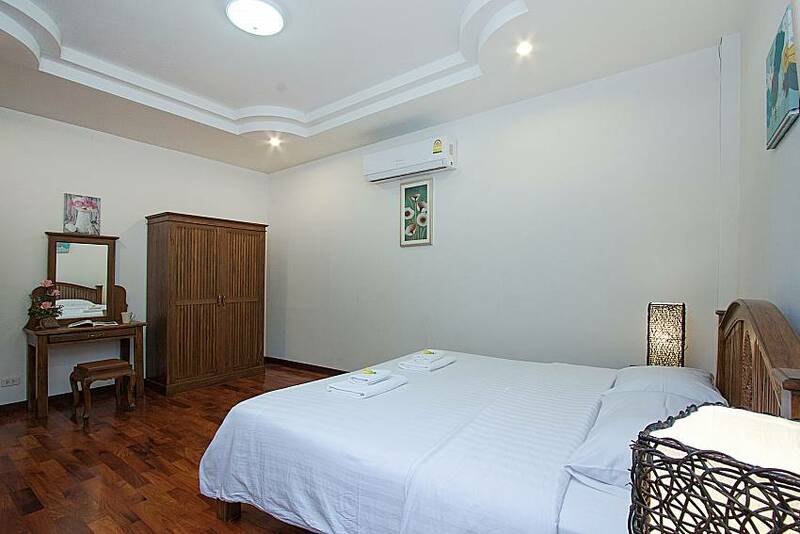 Additional services such as traditional transfer, Thai massage, and private chef are available at an extra cost. 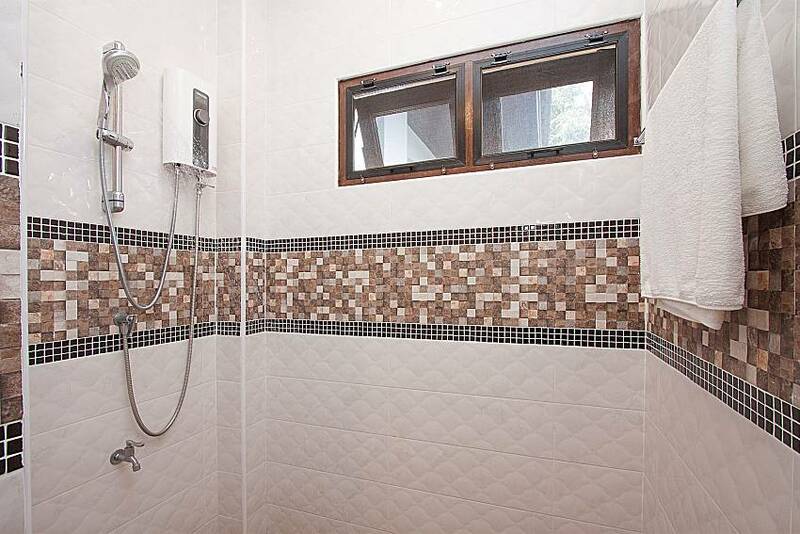 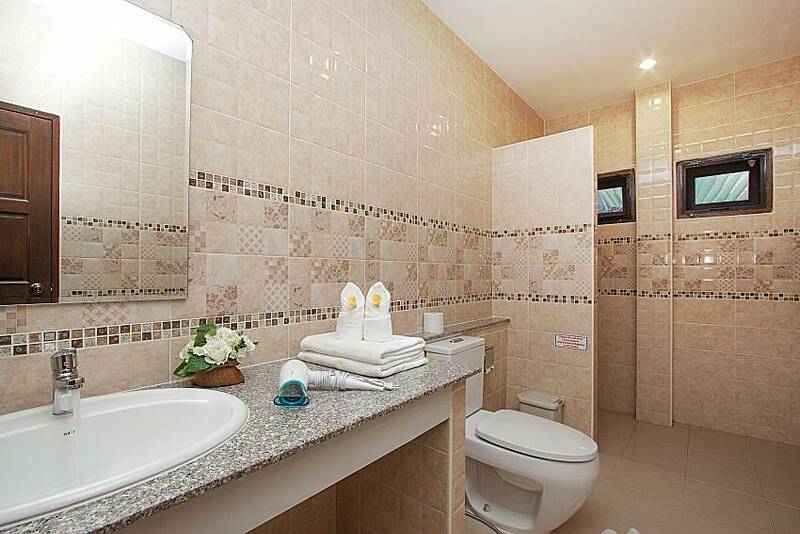 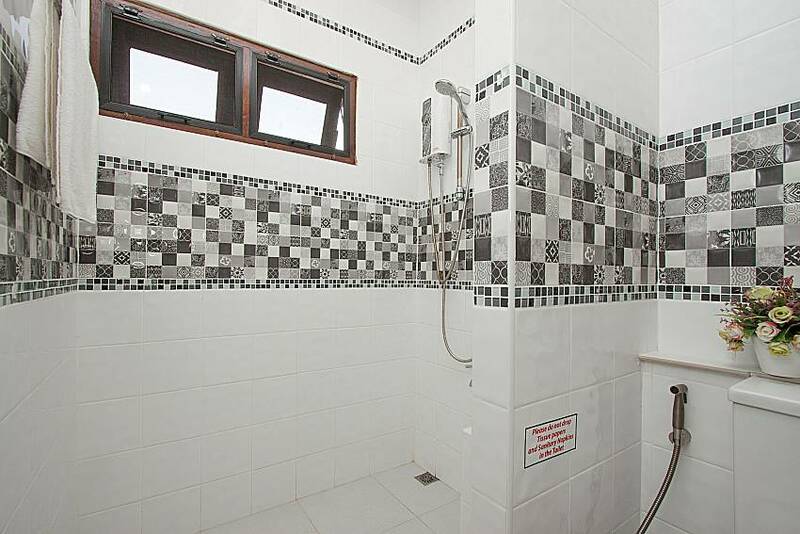 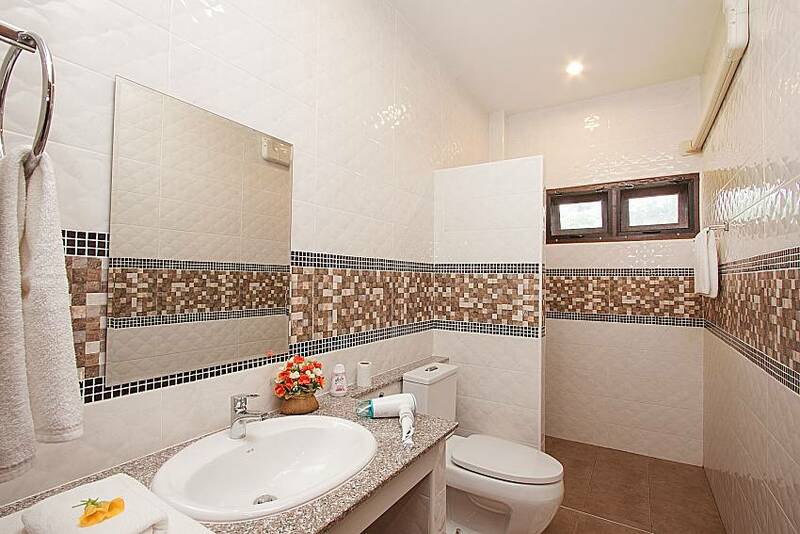 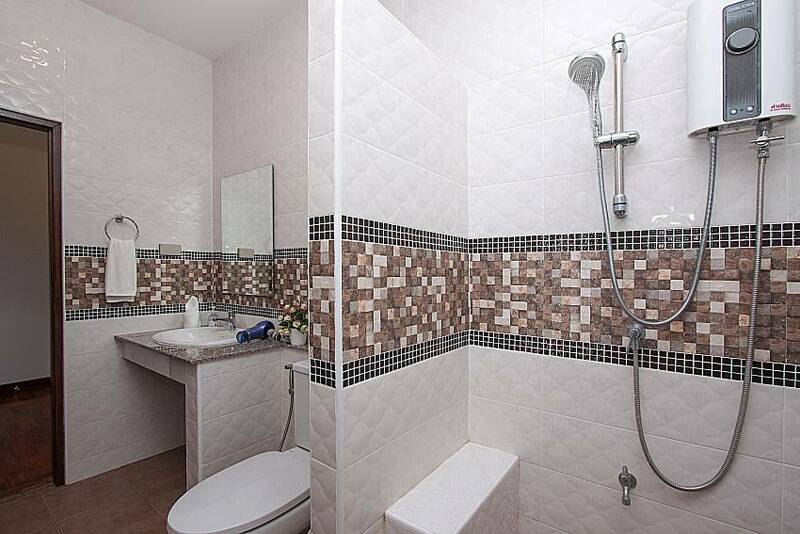 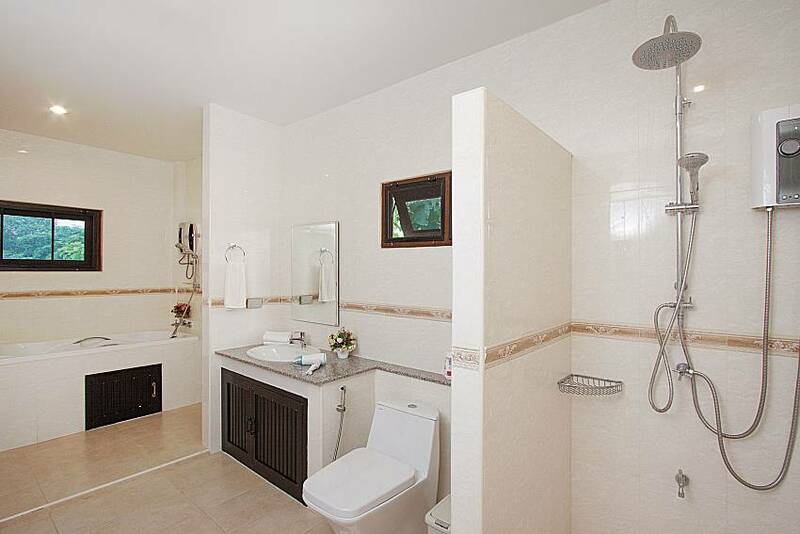 Free Wi-Fi and daily cleaning are included in the rate, and the villa has a private parking with an electric gate. 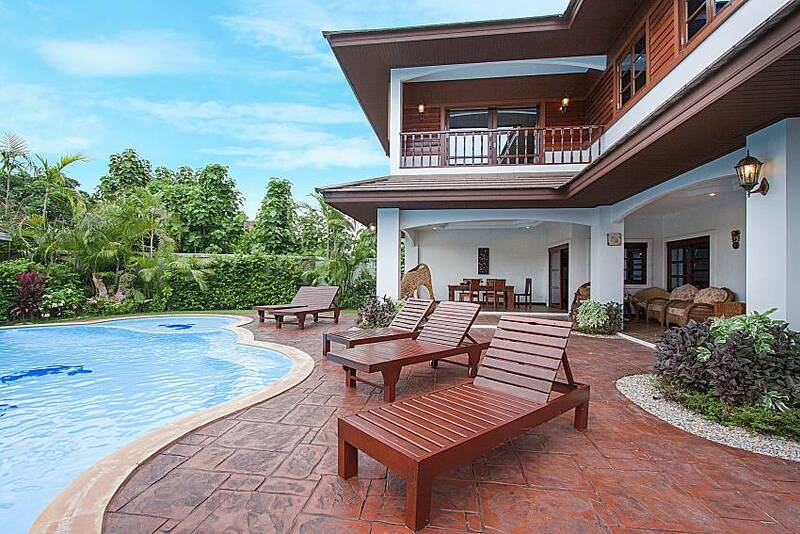 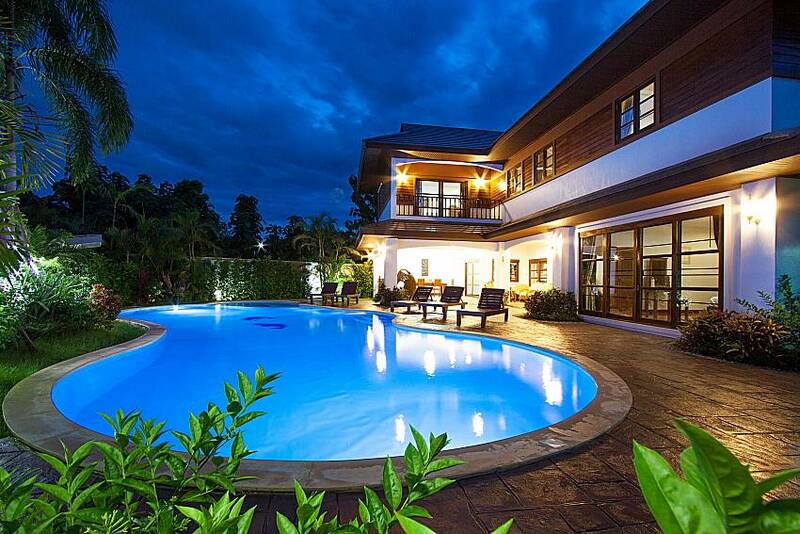 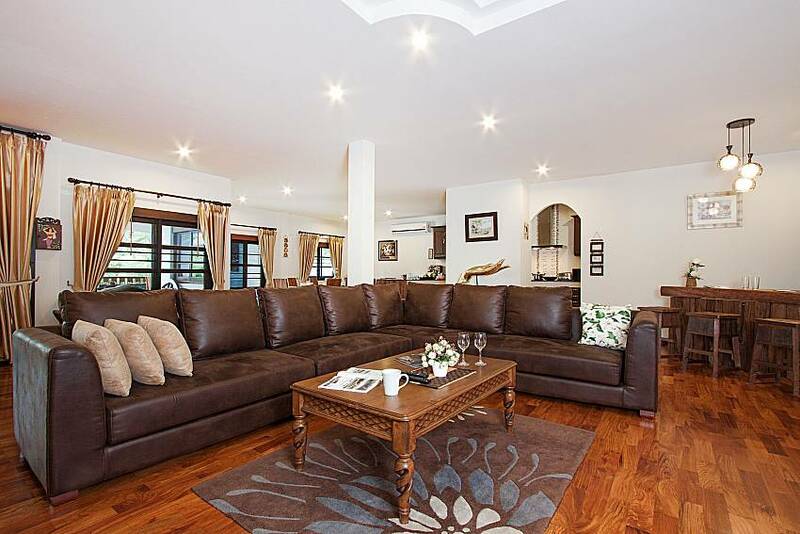 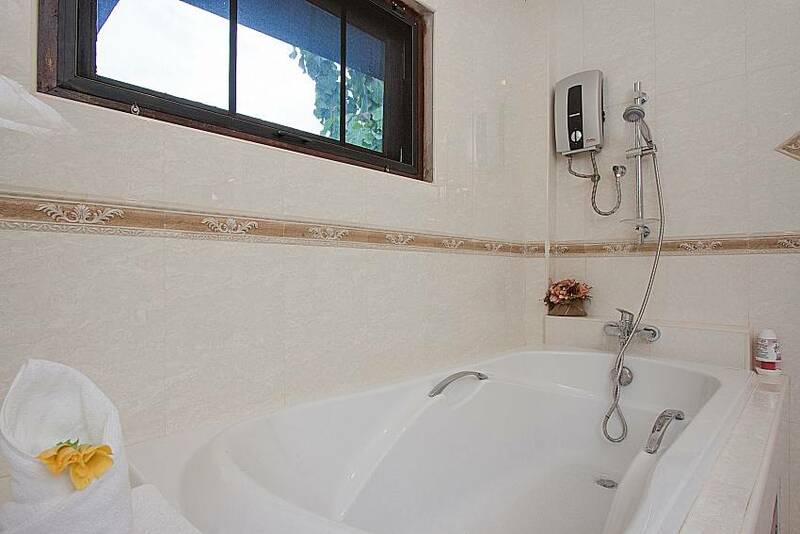 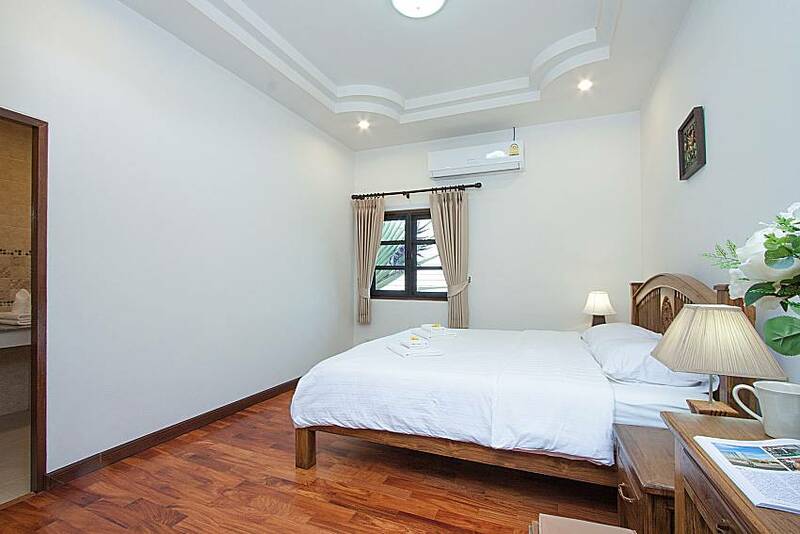 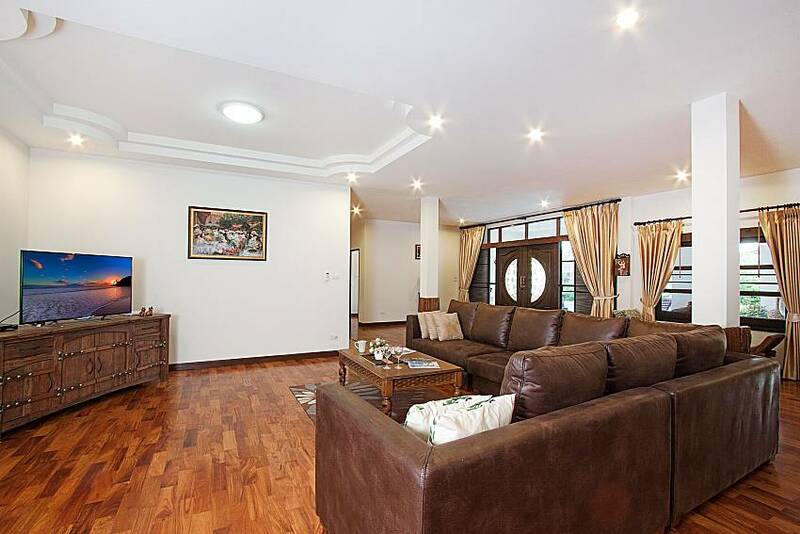 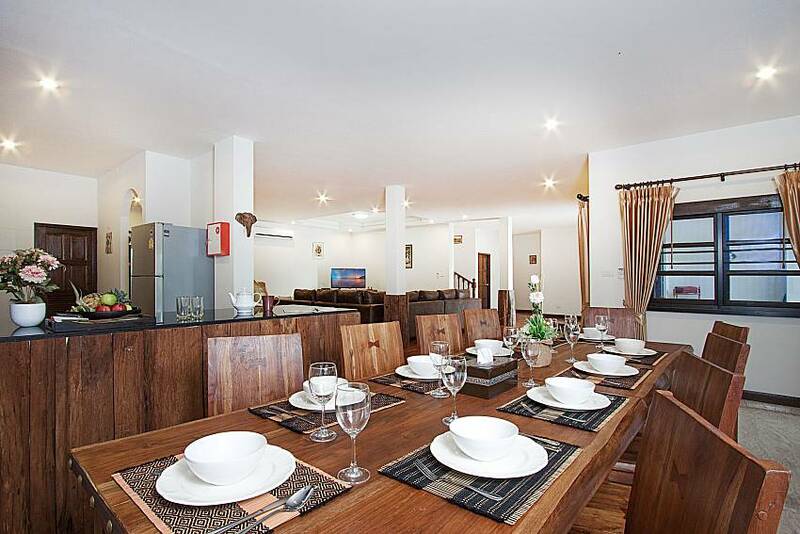 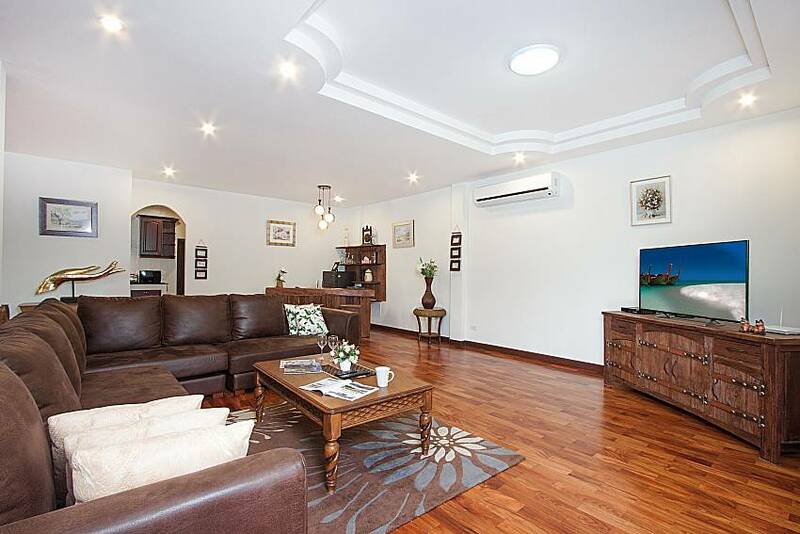 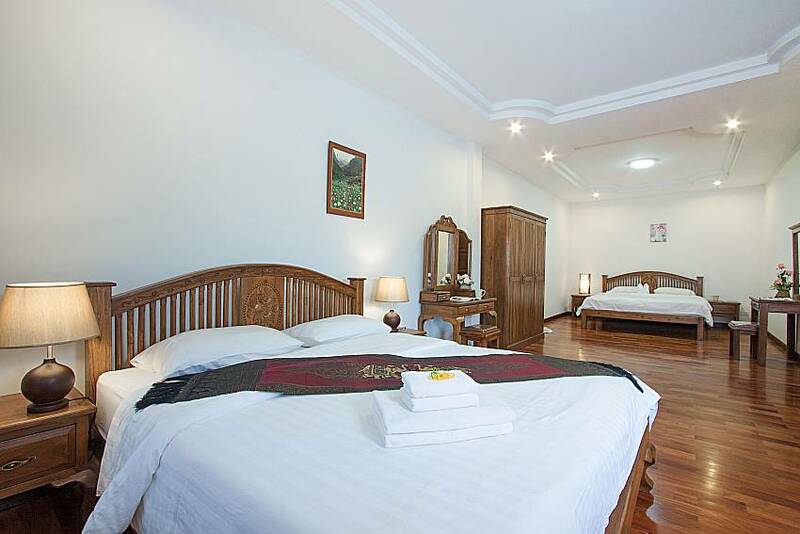 To view all our exclusive villa deals in Chiang Mai, click here. 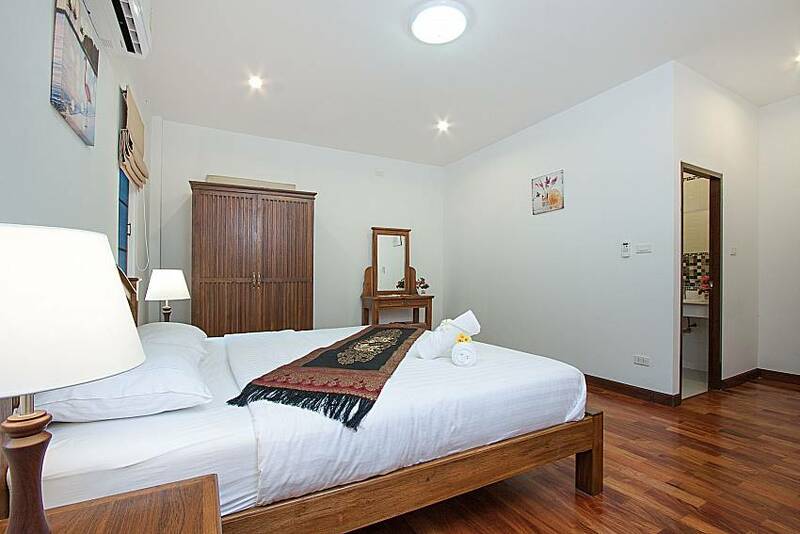 Bookings of less than 5 Nights, Please make an Enquiry.